We have incredible news!!! Remember last week when we said that maybe we would meet the Prime Minister and eat sea cucumber sushi on the Moon? Well guess what– it really happened !!! We never would have dreamed that it was possible, but in an unprecedented and truly historic gesture, Prime Minister Koizumi chose us out of all the American English teachers in Japan to come and meet him on the Moon! And as it turns out, he loves sea cucumber sushi, so we bought him a plate of the best sea cucumber sushi we could find. It was truly incredible. The moon was beautiful, and was just the right temperature. And Prime Minister Koizumi was really nice. 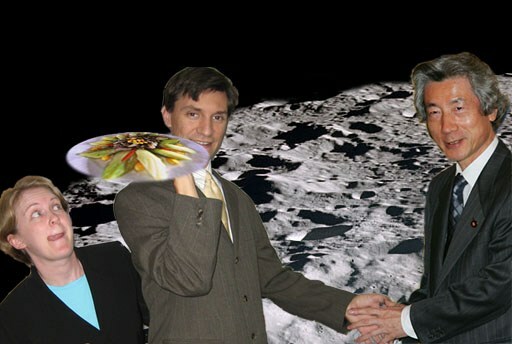 There’s us with Prime Minister Koizumi, on the moon, and there’s our plate of sea cucumber sushi. Jen loves this stuff, if you couldn’t already tell. Prime Minister Koizumi was really excited to meet us. We call him Junichiro, though, cuz’ we’re on a first name basis by this point. There’s the Iatollah, gettin’ funky right here in our apartment. This guy is a party animal! He kept shouting, “Thro ya handz in da aeyah, and wave ’em like ya jus’ don’ kaeya!! !” That was one seriously fun evening. Well, that’s it for this week. We’re looking forward to a more *normal* week next week. NextPictures from Mike’s new job!!! all i can say is WOW. and, that ayatollah is a pretty good lookin’ dude. No fair! Why didn’t you invite me to meet Koizumi with you? After all senority rules here, remember? Tisk Tisk! ha ha! the second picture is almost as crazy as the first! aaah, that WAS a crazy fun evening. Happy birthday again!